Seeds: How many do you need? As you are planning your garden, what to grow would be the first thing that comes to mind. Then, of course, the area you have available, which leads to making a garden map. With the map done, you know how much space you have for each crop. Next is figuring out how many seeds you need. If you are just starting out in gardening, the number of seeds in a packet are probably more than you need for the year. However, as your garden grows and you are more interested in really growing a substantial part of your diet, exactly what to expect from a seed packet is important. You probably already know that not every seed you have is going to germinate. There is a minimum legal germination rate that the seed companies have to abide by. Their seeds can be over that rate, but not under. You can find the minimum legal germination rate in the Master Charts of How To Grow More Vegetables (HTGMV) by John Jeavons. If you buy from reputable sources, most often the seeds are well over that rate. 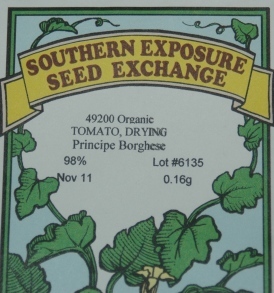 In fact, some companies label the packages with the tested germination rate and when they tested it. On the other hand, I have heard of companies combining old seed with their new batch, getting rid of the old seed and lowering the germination rate. All they are concerned about is making sure it meets the minimum legal rate. Being aware of what the minimum rate is helps you plan. 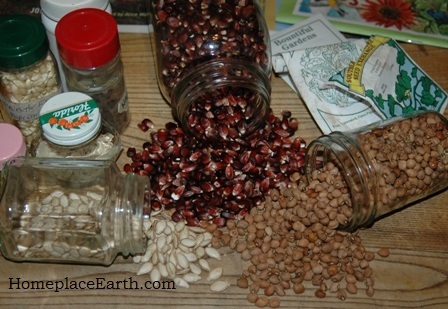 You might be using seed leftover from a previous year or seed that you have saved yourself. Since seed loses viability over time, you might want to test the germination rate. 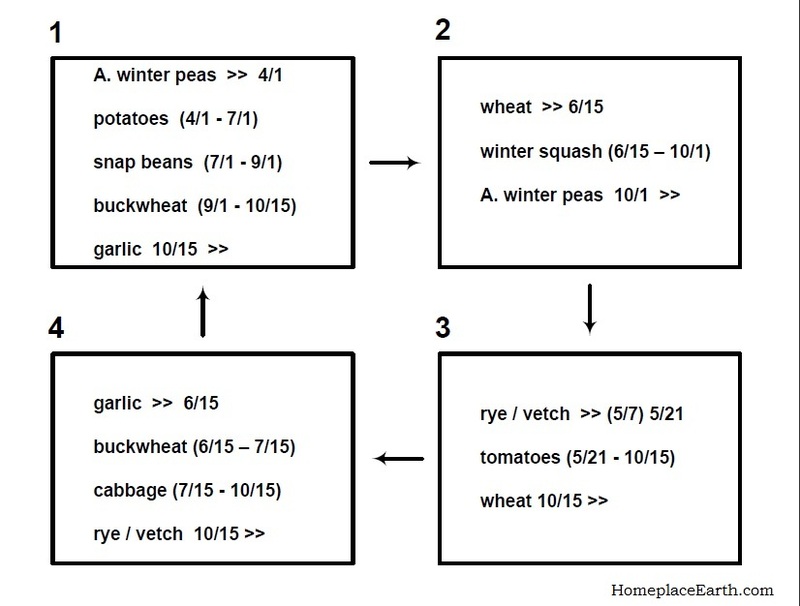 Information on how to do that is available many places, including my video Develop a Sustainable Vegetable Garden Plan. A Seeds and Plants Needed form is included on the CD that comes with that garden plan video. You can print it out and put pencil to paper, or use it in Excel form on your computer. 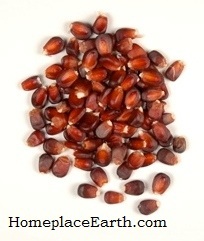 Besides how many might germinate, you need to know how many seeds are likely to be in an ounce. That information is in the Master Charts in HTGMV and in the seed catalogs at the beginning of each crop. The catalogs will tell how much the packets weigh and how many seeds to expect. By the way, there are 28 grams in one ounce. Often the seed packets show the amount of seeds in grams. The seed packets sometimes suggest how many feet of row that the packet will plant. It really depends on how you are spacing your plants and you might be planting in a bed with offset spacing, which would require more plants than just in rows. If you have a small area, work out the planting on graph paper. Once you know the spacing of your plants, either from the seed catalogs, back of the packets, or HTGMV Master Charts, you can figure how many square feet each plant needs and how many will fit in your allotted area. Add about 13% if you are using offset spacing, rather than planting in rows. You have accounted for the fact that some of your seeds won’t germinate, but then not all that do will be the perfect specimens that you want to transplant. You might plan to have as many as 20% more plants than you intend to transplant so you can choose the best. Once you have done the math on your own, worked through the Seeds and Plants Needed form, consulted HTGMV Master Charts, or however you have arrived at your total seeds and plants needed, you should have the number and/or the weight of seeds you need. Compare that with what you find available in the seed packets. For some of you, this is just the information you are looking for. For others, if you are still reading, it is way more than you want to know. One spring, years ago, I was helping a friend who was in her eighties plant her garden. She had only begun taking on the gardening chores once her husband passed, about six years before. We prepared the beds, then it was time to plant zucchini. I asked her how many hills she wanted me to make and she could come behind and put in the seeds. She was confused at what I was asking. Her method was to just plant as she went along and when the packet was empty, she was done. She admitted that she always had more zucchini than she could use. She said it never occurred to her to count the seeds beforehand. Her garden, by the way, was big enough that she could do that. Whatever works for you is the best method to use. Once that way stops working, it’s time to consider other possibilities. I hope you will choose to buy your seeds from a company that has signed the Safe Seed Pledge to not knowingly carry genetically modified seeds. Seeds are precious things. They determine our future survival. Choose varieties that will do well in your area. At first, don’t plant too many varieties of one crop until you have a base knowledge of that crop in general. However, everyone wants to experiment and will usually try the new thing that comes along at some point. I remember when Sugar Snap Peas were released back in 1979. The pole variety was the only one available then. I liked them and have been growing them ever since, adding Sugar Ann as a bush variety. Other things I’ve tried, such as early or disease resistant tomatoes I didn’t like so much. Often, people want to know what I’m planting. I want you to do the homework yourself. There are just so many reasons why you would plant different things than I do. Read the seed catalogs, especially the ones that specialize in your region. Talk to other gardeners. If you don’t know any other gardeners, maybe you could put up a notice in your local library to have a gathering. I believe most libraries will make a room available for things like that. A Seed Swap would be a good topic to start with. At a seed swap, everyone brings in their extra seeds to share and people who want some can take them. It might be seeds that were left from another year or extra from this year that you know won’t get used. Having old envelopes on hand and pens for labeling is helpful. It’s also good to have seed catalogs for more information. Usually you don’t need to contribute seeds to be able to take some home. If you are new, this is the place to find gardeners. If you are an experienced gardener, this is the place to offer the help that you wished someone gave you when you were coming along. On a local note, there is going to be a Seed Swap at J. Sargeant Reynolds Community College in Goochland, VA on March 24, 2012 from 2-4 pm. The public is invited. Here in Virginia, the weather has been so mild, we were wondering if winter was ever going to start before it was over. We just had a 4.5 inch snow, but it’s not even lasting 24 hours. Very soon it will be time to be in the garden. Acquiring all your seeds for the year now will help your efforts go smoothly the rest of the year, with no delays between crops. Some things you try this year will work great, and some, not so much. There are no mistakes. Everything is a learning experience. The most important thing to remember is to have fun. If you are serious about growing your own food, having a good map of your garden space is essential. At one glance it can show you what is planted where, any day of the year. It will also show when one crop is expected to come out and the next go in. My garden map is the one thing I refer to more than any of my other garden records throughout the year. Here is a copy of the map of part of my garden. 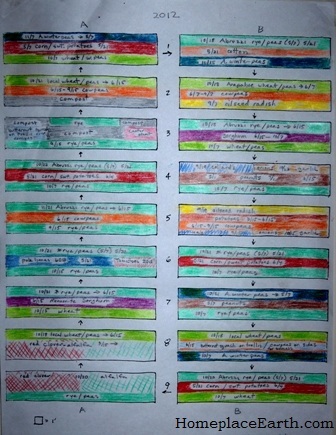 As you can see, I add color to easily identify the crops grown. To make your map, measure your area and draw it out, showing where the beds are. If you are making a garden for the first time, you need to decide where those beds will be. I prefer to run my beds from east to west. Four feet is a good width for most people. People with a shorter reach may prefer a 3’ wide bed, but I wouldn’t go any narrower than that, unless you are planting against a wall or fence, then the bed might be only 2’ wide. The wider the beds are, the more efficient use of space, but there is a limit. You need to be able to reach all parts of the bed without stepping in it. I would caution against anything wider than 5’. Label each bed with a number or letter or, in some cases, both. My large garden has four sections (A,B,C,&D), with each section having 9 beds. So I have A1-A9, B1-B9, etc. Maybe you want to give each bed a name. It’s your garden. Labeling helps to identify each bed in your planning. 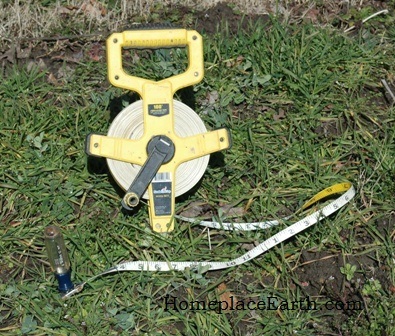 To get the measuring done, a 100′ tape measure is a great help and is fairly inexpensive. There is more to a garden map than the outline of the beds. It helps your planning if all the beds contain the same area. Many of your crops will occupy a whole bed—tomatoes, corn, and potatoes come to mind. Some will need less space, such as lettuce and zucchini. Those can be grouped together in a bed. You will need to plan rotations and put those rotation arrows on the map. It is not good to keep planting the same thing in the same place year after year. That goes for things in the same crop families. You can plan so that the crop, or group of crops, that are planted in each bed rotates to the next bed the next year. There is a lot to explore in the area of rotations. Eliot Coleman has a chapter in New Organic Grower about rotations. Also, The New Self-Sufficient Gardener by John Seymour is a good resource on the subject. My pet peeve with computerized garden maps that are often available is that they only show you the plan for one year, with no rotations. It may be that part of your garden is shady and you have specific crops that go there. In that case you would have two rotation plans—one for the shady area and one for the sunny part. Maybe you have both large and small area beds. If the large areas are twice the size of the small areas you might do as Brent did in my garden plan video and count each large bed as two beds. Or, you might have a rotation schedule for the large beds and one for the small beds. If you have only one garden bed, consider rotating the spaces within the bed. Once you have the map drawn, complete with the rotation arrows, have some copies made to play with. Write in the names of the main season crops you will have there and the beginning and end dates those crops will be in the beds. Your garden is out there every day all year soaking up the sun. Fill in the beds for the rest of the year with additional crops, cover crops, companions, etc. If you don’t plant something there, Mother Nature will. Once you think you have everything like you want it, take a good look. If you have overwintered cover crops or eating crops such as greens or carrots in a bed, the group of crops rotating to that bed the next year needs to begin with what’s already going to be there. If you plant garlic in bed B3 in the fall and the next year the crops from the current year B2 will be planted there, that selection of crops from B2 needs to begin with garlic. Most often it is a cover crop that will be overwintering. If a bed is the first to be planted in the spring with onions, lettuce, and sugarsnap peas, the cover crop planted there in the fall needs to be one that will winterkill. Or, you could prepare the bed in the fall and cover it with leaves. Pull them back two weeks before planting time to allow the soil to warm up. You can click on the pictures in my posts and they will each open larger in a new window. If you take a closer look at my colorful garden map you will see a couple places where the rotations don’t match for the next year. That’s because it shows what’s there right now as the first crop, but I’ve made some changes for next year, so the last crop in the bed will be with the new plan. For more information on planning cover crops for sustainability, refer to my blog posts Planning for Soil Fertility and Compost Materials on August 9, 2011 and Choosing Which Cover Crops to Plant Where on August 23, 2011. For cautions on bringing in outside sources of mulch and compost read Killer Compost from July 26, 2011. My video Cover Crops and Compost Crops IN Your Garden takes you through the year from March to November, showing you the different cover crops and how to manage them using only hand tools. It is good to have a “to-scale” map, but in some cases your working map might look a little different, with the beds large enough to write in all the necessary information. Just as long as you know how much area you are working with and that what you are planning for that area will fit. In my video, Develop a Sustainable Vegetable Garden Plan, I work through the rotations in this 4-bed plan. I’ve had people tell me they really didn’t understand rotations until they saw me explain it in the video. That video comes with a companion CD that includes this 4-bed map, plus worksheets to help you plan when your crops need to be planted, how long the harvest will be, and when the bed will be ready for the next crop. In addition, the CD has a 7-bed rotation map that corresponds with Betsy’s Garden at Sunfield Farm, the garden you see in the video. That map is included as a real-life example of a working rotation. Now that you have your map as you like it, label it with the year and “Proposed”. Take two more blank maps (which is why you need to make multiple copies) and label one “Actual” and another “Amendments”. Put them in your garden notebook and fill them in as you go along. At the end of the season, you will have a record of what actually was in each bed and when. You will also have a record of anything you may have added during the year on the amendments map. Have fun with your garden maps. Spring will be here soon and you want to be ready.